The picturesque Tyrolean village of Soll offers lift-linked access to the largest lift-connected and the largest artificial snow covered ski area in Austria - the Skiwelt Wilder Kaiser Brixental. The resort is located at the foot of the Hohe Salve mountain in the centre of the SkiWelt, itself part of the giant Kitzbuhel Alps. When will it snow in Söll? The next notable snow forecast for Söll is 4cm2in, expected on 26 April, with around 12cm5in forecast over the next 7 days. The Austrian Ski Resort of Söll is part of the SkiWelt area with access to 280km174 miles of downhill skiing, with 186 marked pistes, served by a total of 90 ski lifts. In addition to the skiing in Söll itself (27km17 miles of pisted ski runs), the appropriate ski Lift Pass will allow you to ski or snowboard in the other SkiWelt ski resorts of Brixen im Thale, Ellmau, Going am Wilden Kaiser, Hopfgarten im Brixental, Itter, Kelchsau, Scheffau am Wilden Kaiser and Westendorf. Located in a wide sunny valley only 15km (9 miles) from the German border, the favourable location of Söll, both in terms of how easy it is to reach and how well placed it is in the centre of Austria's largest lift-linked ski area, has led to its fame greatly exceeding its size. Indeed, whilst Söll is no longer a tiny village, it has successfully endeavoured to maintain a 'village feel' whilst at the same time introducing modern leisure and accommodation opportunities for guests. New building has been completed to traditional architectural style and the village centre is now pedestrianised, making the whole effect even more pleasant. It is still centred around its impressive onion-domed church and maintains a relatively healthy ratio of almost 1:1 for locals-to-tourists. Four centuries ago this was a village of farmers with very few tourists, today Söll still has its farmers but they're now second to tourism as Söll's major employer. Long popular with British, as well as German visitors, English is widely spoken, including by all ski school staff. The most difficult run is the 'Alpseite', which is 11km7 miles in length. Well placed at the heart of the largest lift-linked ski area in Austria, the Ski Welt with 250km of trails also holds the title of having the most artificial snow covering in the country, when needed. Add to that the fact that Söll is part of the huge Kitzbüheler Alpen Ski Pass, an alliance of five ski areas offering a combined total of 260 lifts, and you have somewhat unlimited skiing opportunities. 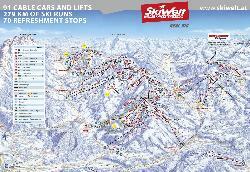 A 3D piste map is available to help you find your way around. The area got bigger still in 2005-6 when the Ki West gondola created a lift link between the SkiWelt and Kitzbühel's ski area thanks to a 4km long gondola between Westendorf and a point near Kirchberg. A short bus journey is required to reach Westendorf and from the gondola base at Kirchberg to the lifts that link to Kitzbühel. Beginner skiers taking ski school lessons will normally be happy with the cheapest local pass, introduced in the 2000-2001 season for beginners in ski school only. which covers 34km (21 miles) of trails on the Hohe Salve mountain above Söll. You can also put your ski kit in an overnight ski store by the nursery slopes if you want to avoid the downside of those first few days on the piste - having to cart your heavy kit on and off the ski bus (which you can ride free when you produce your Guest Card, provided by your accommodation). The base of the lifts is about 1km (3/4 of a mile) from the village centre so transport is required, be it the ski bus or your own. The first lift of the day for most is the 8 seater gondola up to Hochsöll from where runs radiate in most directions to inter-connect with other resorts, ideal cruising territory for the advancing intermediate and there's a snowy plateau for beginners. The local slope that experts will most enjoy is the FIS approved 7km (4 mile) black back down the mountain, but for longer stays the Kitzbüheler Alpen Ski Pass will be a boon for visiting the tough runs in nearby ski areas. Night skiing is also possible on six kilometres (four miles) of runs down from HochSöll beneath the gondola to the village several nights a week. The Ski Welt has a 'boarder-friendly attitude as well as some useful terrain. There are terrain parks in Ellmau (complete with kicker, rails for sliding and a ground loop), Westendorf and Soll. We don't currently have confirmed season dates for Söll. Usual opening is mid December, and usual closing is Early April. NOTE:- Lift and Piste openings are always subject to Snow Conditions in Söll. Söll is able to make snow, on 210km130 miles of ski runs, with 1000 snow cannons. The 12 ski lifts of Söll are able to uplift 135,100 skiers and snowboarders every hour. Söll is in the Austrian Alps in Skiwelt, Kitzbuheler Alpen, Austria. The nearest airports to Söll are Innsbruck Airport, Munich and Salzburg. There are eight airports within three hours drive. Innsbruck Airport is just one hours drive away, in good driving conditions, so you can be on the piste quickly. The Webcams in Söll are not always up-to-date. Please check the date on the image to ensure you are seeing current snow conditions. Söll's evenings can be lively and this is a good choice for those in search of the ambience of authentic Tyrolean entertainments in their traditional setting - there can be zither music and fondues a-plenty if you want it! Those searching for the more universal international night club and discothèques are catered for also, with the popular Whisky Mühle. For a bit of additional exertion the 3.5km (two mile) toboggan run is illuminated and open at night as well as during the day, accessed by the 8 seater gondola. Night skiing is also possible several nights each week on a 6km run down to the village. A weekly activity programme includes guided winter hikes and snowshoe walks bookable through the tourist office. Want to Know when it Snows in Söll? 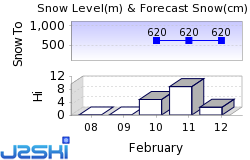 Click above to get Snow Reports by e-Mail for Söll. By doing so, you agree to Our Rules. Other popular Ski Areas near Söll. Want to ask about skiing and snowboarding in Söll? Or contact Söll Tourist Office. Note :- The information on J2Ski concerning Söll, where not clearly factual, is opinion only and is neither definitive or exhaustive.